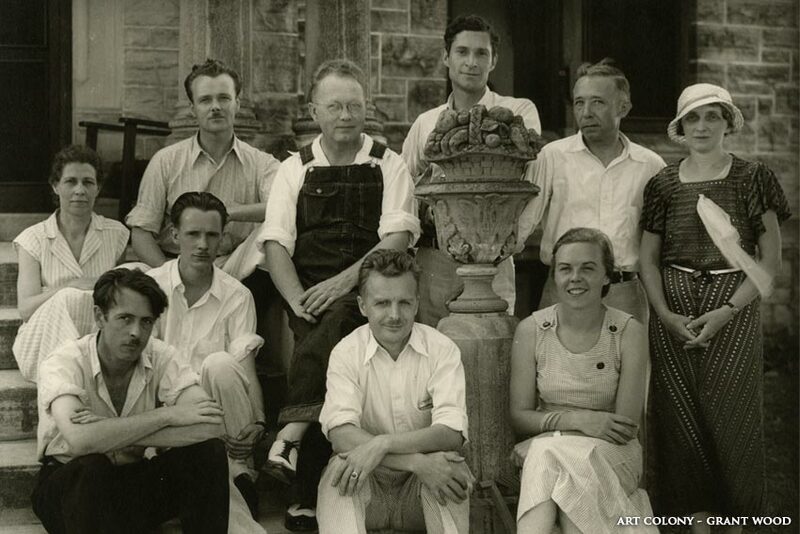 In 1932, Grant Wood and Adrian Dornbush established an art colony in Stone City. With little more than $100 and promissory notes based on the success of the art colony, they leased 10 acres of land on the Green estate. It included the Green mansion, Ice house and Water Tower. The upstairs of the mansion was converted into a dormitory and the rest of the house was used for a business office, kitchen and sculpture studio. The basement of the Ice house was converted into a bar called “The Sickle and Sheaf” where instructor Dennis Burlingame tended bar. The upper portion of the water tower was converted to a small apartment where Adrian Dornbush lived. It was referred to as “Adrian’s Tomb”. As many as 120 students enrolled and some were housed in ice wagons. It was a mecca for artists and art lovers. Sunday afternoon tours were offered to the public. In terms of attendance and reputation, the art colony was a huge success. However, it was never a financial success since many of the students were allowed to work in exchange for tuition.